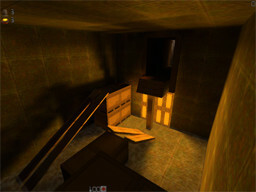 "An old map that looks quite good....yet it is unplayed...."
Point Alpha is one of the "older" maps in the Gloom archive. I remember playing this map in my early Gloom days, and I really enjoyed it. Now, however, it is scorned by many players for some reason. I really dont know what that reason is, but Im thinking it might be because the level is a bit spider-oriented. The architecture reminded me somewhat of how Lifer maps. Not with as much detail, but similar for some reason. The texturing was kept to a nice, facility-like theme (that weve seen all too often), and maintained througout every part of the level. The lighting is where I came to problems with. I booted the level up with my video settings at default, and I couldnt see a damn thing. After a bit of video tweaking I managed to be able to see quite well. No, I did't up the GL_Modulate if thats what you're thinking (go to hell bastards!). A nice feature I noticed in this map, which I am dearly thankful for, are the LOW R_SPEEDS!! They never went about 300....once. Of course, I was by myself looking at this level (since its not played on public servers anymore), but I can imagine that Point Alpha would provide signifigantly low FPS during any game. I wish more map authors would keep tabs on R_speeds as they map, it really gives low-enders (yea, thats me...shutup!) a pleasant gaming experience. I did encounter some issues while testing this map. The spawn points for each team were layed out crappily (is that a word? No? I thought not). Bunched together, like most of the early maps were. The bases for each team aren't wisely chosen either, although the Human base is better suited than the Spider's. There are also a lot (and I mean a lot) of doors present in this little level. Im guessing the author used the doors with area portals to make sure framerates were optimal, but doors are commonly known for sticking to classes with large bounding boxes, spoiling a much needed getaway. 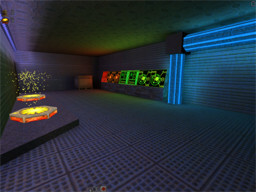 Aside from a few problems, Point Alpha looks like it would be a lot of fun to play. When I played it "Back in tha' day", I really enjoyed it. It is a bit cramped in some places, providing a little advantage for spiders, but the doors make up for that >:). If you're feeling a little run-down by all the new maps being released now, download this oldie and run around it for a fresh nostalgia of how it used to be. Comment: Textures were uniform throughout the level. Kind of bland...but kept to theme. Un-alignment is vivid here. 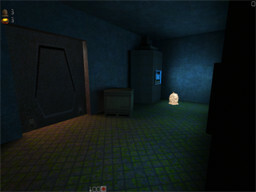 Nice light sources though...even if the level is somewhat dark. Comment: From what Ive seen (and remember), the maps layout is actually pretty good. A good portion of hallways connecting the map, but it doesnt look like the author threw hallways in anywhere he thought he could connect the map. Obvoiusly a well thought-out map design. Mucho base relocation areas...and some good hiding spots. The bases were a bit of a let-down though. Crappy original spawn placement. Overuse of doors I would also say. Comment: Basically a facility of some sort, and thats been done to death. 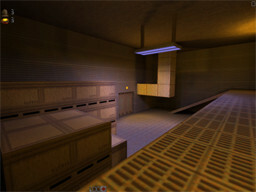 Although this map is old, compared to todays Gloom standards, the theme is too well-known. Comment: I seriously cant see why this map is'nt being played anymore. It seems like an ok map, aside from it being a tad too dark and a few other instances that bugged me, but overall, it looks ok. This review has been read 1059 times. The Gloom Map Depository is copyright Team GMD. Quake2 is a registered trademark of Id Software. Gloom is copyright Team Reaction. The review script is copyright R1CH.